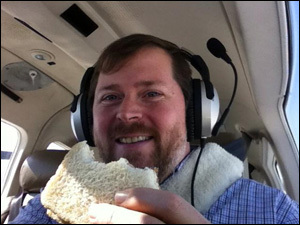 Most pilots are familiar with the $100 Hamburger. This past week though I enjoyed my first $82.50 PB&J. For months I have been trying to think of ways to find more time for flying. Recently, I started wondering whether I could fit a flight in during lunch. 1:25 Arrived back at the office. I logged 0.5 hours of flying and got three landings for the logbook. Not necessarily the best or most useful flight time but a different way for me to get a taste of flying and stay current without taking away time from the family in the evenings. I think I will do this again for sure and think this might be an interesting way to share aviation with others. Maybe this summer I will try to do this type of flight once or twice a month and invite a co-worker to join me for a quick tour of the area or a flight along the Chicago skyline. This is by far the best way I can think of spending lunch. The Peanut Butter and Jelly was average but the ambiance was unbeatable! As part of the FAA Wings program I recently took and completed the "Art of Aeronautical Decision Making" online course. The FAA defines Aeronautical Decision-Making as a "Systematic approach to the mental process of evaluating a given set of circumstance and determining the best course of action." More practically they use a framework for ADM and risk management: Perceive - Process - Perform. 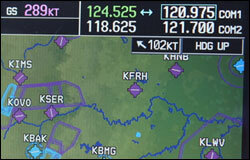 AOPA's Air Safety Foundation uses "Anticipate, Recognize, Act". Both promote identifying an issue, determining a plan to mitigate or eliminate risk then putting that plan into action. ASF says "...the thing that seems to cause pilots the most difficulty -- is recognizing potential hazards and taking timely action to avoid them." With every flight, pilots get a chance to use their ADM skills. However, I did not anticipate the level to which these skills would be used when a fellow flight club member invited me to join him for a flight in his Columbia 400 (now called the Cessna 400). The mission was to fly from Chicago to Miami University in Oxford, OH (my alma mater) to pick up his daughter and bring her back to Chicago. He was planning to file an IFR flightplan and use supplemental oxygen allowing us to fly at 18,000 feet, more than double what I typically cruise at. I figured this flight would be a great learning experience for me, having never flown in a Columbia 400 or having much experience with instrument flight plans. Little did I know what a great learning experience this flight would become. About forty-five minutes from our destination airport cruising along at FL180 and enjoying a 100 knot tailwind that was helping us achieve a 290 knot ground speed, Ray and I felt a hiccup in the engine and what felt like a short-lived decrease in power. We looked at each other than quickly switched the G1000 Multi-Function Display (MFD) engine page to check for any anomalies. There were no red flags As we were doing that the issue replicated itself. At that point we agreed an issue might be imminent and that he would continue to fly the plane and I would take over the radios if an emergency developed. We knew altitude was on our side and we agreed on an airport we could safely glide to while we troubleshooted the issue. Unfortunately, we had not identified a likely cause when the issue happened twice more in short succession. Each time we were seeing manifold pressure decrease with the hiccup and we noticed the oil temperature was lower than normally expected but still no clear cause or resolution presented itself. Despite that we had a specific mission for this flight, "to pick up his daughter", we agreed there was a significant risk at hand and that we would be best to troubleshoot this issue on the ground and have a mechanic checkout the engine. It would have been easy for Ray to have stayed in "Mission" mode or to be swayed by Get-There-Itis and keep pushing through. But, we are both all too familiar that too many pilots have lost their lives or their aircraft with such decisions. Without thinking about it we had just completed Perceive and Process in the FAA's Solution and Recognize in the Air Safety Foundation's thought process. Now it was time to Act or Perform. We agreed now was a good time for some Crew Resource Management (CRM) so Ray continued to focus on flying the plane while I took over responsibilities for radio communications. We informed Air Traffic Control that we wished to divert to Delaware County Airport in Muncie, IN. As we switched over to the Delaware County Tower the controller was aware we had been experiencing some engine irregularities and radioed "Columbia N262RK are you declaring an emergency? ", a phrase no pilot wants to hear. I was relieved to be able to respond "Negative, we are not declaring an emergency and we have the runway in sight." A few minutes later we were safely on the ground. A few years ago I made a precautionary diversion due to deteriorating weather conditions, this was the first diversion related to a mechanical malfunction but proved to be my best example in my flying experiences of appropriate use of Aeronautical Decision Making skills. A few days later I learned the mechanics determined the issue was caused by pin size holes in an exhaust host to the engine manifold, which I guess is common in turbo planes. The plane was not in imminent danger but I believe we made the right decision mitigating the risk. A wise person once said "the difference between an ordeal and an adventure is your attitude" and on that day we had the right attitude and enjoyed our afternoon at the quiet Muncie airport enjoying a meal at Kacy J's Airport terminal restaurant while we waited for the cavalry. Marc, the Leading Edge Flying Club President, offered to fly down in the club Cirrus SR20 to help us complete the mission. As a result I got another new experience out of the day. It was my first time flying in the Cirrus SR20 which Marc let me fly for much of the short flight from Muncie, IN to Oxford, OH. I enjoyed a brief visit to Oxford before we turned for home. With four passengers and some baggage we had to manage fuel and make a fuel stop in Lafayette, IN before successfully completing the trip back to Chicago. Although the flight did not go as planned, I had a great day of flying and aviation camaraderie none the less. Below are some photos from the day. In my mind there is no better sightseeing than aerial sightseeing. Over the Thanksgiving weekend while visiting family, I met up with Mike Bennett from 110Knots.com to explore New Jersey and New York from the air. A few years ago I flew the Hudson Corridor route to get an amazing view of New York. On that flight we stayed below the Class B airspace. This type of flight was criticized last year when a helicopter and plane crashed in this congested and uncontrolled airspace. Mike offered to show me the other New York Flightseeing experience, the Class Bravo flight experience. I met Mike at his home base airport, Morristown Municipal, and we pre-flighted his club's Cessna 182RG while he filled me in on his route of choice. He prefers to explore New York City from the Class B airspace. His plan was to request a frequency change to Newark Tower (just a few miles away) right after take-off, then request to fly into Class Bravo airspace over Newark up the Hudson to Central Park, cross the park and travel back down the East River then crossing back past Newark. We were flying the Sunday after Thanksgiving, often considered the busiest travel day of the year. I was a bit worried that Air Traffic Control would be less than welcoming to our request on such a busy day. However, ATC could not have been more accommodating. As soon as we were airborne we called up Newark Tower who cleared us into the Class B and asked us to overfly runway 22 numbers at 2,500. As we approached Newark we had a fabulous view of Statue of Liberty with the city along our horizon. We received some traffic advisories but most of it was helicopter traffic below the Class B airspace. As we flew up the Hudson and approached the northern part of Central Park, we were handed off to LaGuardia, who instructed us to ensure we stayed over the East River and did not fly any further east. 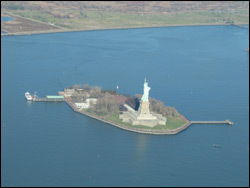 From there we flew south back down towards the Statue of Liberty. We took in some amazing views of the buildings, parks and bridges. I am used to the congested airspace of Chicago but was impressed with Mike's almost effortless ability to rapidly transition from Morristown to Newark to LaGuardia, back to Newark then on to New York Center. We talked about his instrument training and how that helped him to become a better pilot, as it does for most pilots. 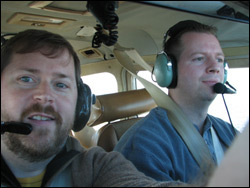 I was inspired after flying with him and further charged to pursue my Instrument Rating. Once we were done sightseeing we flew back over Newark and headed west to Pittstown, NJ. We landed at Sky Manor (N40) which calls itself "The best little airport in the East." It lived up to it in my book. This is quaint little airport with a 50 foot wide by 3,000 foot long asphalt strip that has a restaurant located right off the runway. The restaurant offers great windows for grading landings. A perfect place to enjoy the company of fellow pilots and to do some real flying in addition to some hangar flying. I have moved it to the top of my list of Best $100 Hamburgers. After brunch we did a short hop back to Morristown. It was a great flight in which we logged 1.3 hours, I had my first flight in a Cessna 182, added two new airports to my list of visited airports, took in some amazing sights and enjoyed some nice conversation. This day re-enforced my belief that there is no community better than the aviation community. Fall is my favorite season for flying. A combination of mild weather for preflight of the airplane, enjoying the cool breeze entering the cockpit from an open window and the view of autumn's magnificent show of colors is the perfect combination for me. This past weekend Northern Wisconsin experienced their peak weekend for the annual fall show of colors. There are numerous scenic drives in the Door County Peninsula that show off the brilliance of this season, though the best view requires getting airborne. I rented a Cessna 172 from MaxAir, the new Fixed Based Operator at the Sturgeon Bay Cherryland Airport, and flew an oval circuit around the Door County peninsula. The Cessna is a great aircraft for fall foliage flights because the raised wings give you an unobstructed view of the colors below. The conditions were perfect for the flight. 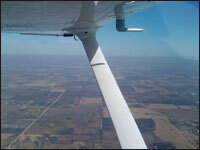 At both Sturgeon Bay and Ephraim-Fish Creek Airport the winds were calm with great visibility and high ceilings. In the air the ride was smooth and I enjoyed flying most of the flight with the pilot side window open and taking in a nice smooth and cool fall breeze. I was not surprised that on such a beautiful afternoon, I was not the only one with the idea of enjoying the fall colors from above. The skies were crowded at times as were the patterns at the two uncontrolled airports I visited during the flight. However each pilot seemed to be operating with their "A Game" as all pilots were on the same page and communicating their intentions clearly, which was nice. Pilots if you haven't already, get out and enjoy the show. Aviation enthusiasts and future pilots what better time to take an introductory flight and learn about flying with one of the greatest backdrops below. I have been flying now for nearly six years. One thing that has been consistent throughout that time frame is my inability log significant flying time in the winter. Although, I had hoped things would be different this year, alas I have not flown in several months as we work through the one of the cloudiest winters in Chicago's history. According to Tom Skilling we had 27 sunless days between December 1, 2009 and January 31, 2010 making this the third cloudiest winter since records have been kept in over 116 years. With fewer clear days it makes it difficult for us pilots who rent the aircraft we fly. With fewer days of sunlight in the winter the competition gets fierce when a sunny day finally shows up on the five-day forecast which often makes it difficult to find a plane to fly in the winter. Curiosity drove me to look through the logbook to determine how much less I fly in the winter compared to other seasons. I factored out the four summer months in 2004 when I logged most of my hours to earn my license as to not skew the data too heavily. Even with the omission of the training hours I discovered that only 10% of my flight time has been logged in the winter. The number was even worse, just 6.5%, if I included the 47.5 hours flown in the summer of 2004 to earn my license. This is a frustrating fact for any pilot who knows that flying consistently is directly tied to safety. On the bright side, although Punksatony Phil may think we have six more weeks of winter, based on looking at my flying history I only have about four more weeks of Winter. Come March I tend to end my flying hibernation as I typically begin to make up for lost time and fly much more consistently from March through May making the Spring the season I log the most hours. 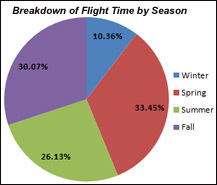 Fall nudges out summer for the number two season, which is no surprise as it is by far my favorite season to fly. It is hard to beat viewing the changes in the fall colors from above? Thanks for all those who have reached out to ask where I have been. As I start to get airborne more regularly I am sure I will post more frequently as well. Spring has arrived in Chicago, well atleast for a day it has. I enjoyed waking this morning to a nice cool breeze coming through the bedroom window and new it would be a great day to fly. I pulled up AOPA's online flight planner to get updated weather and added the weather data to my NAVLog for the flight from Chicago Executive to Porter County Municipal Airport and back. I did a quick visual check out the window and it confirmed what I saw on my computer monitor, it was going to be a wonderful day for flying. Chicago Executive was reporting few clouds at 5,500 but everywhere else along the route was reporting clear below 12,000 and greater than 10 miles visibility. After completing my pre-flight I contacted Chicago Executive Ground. They said I could choose any runway as there was not much traffic yet and the winds were calm, so I selected the nearest runway. As soon as I was airborne I turned Eastbound to head towards the lakefront. After clearing Chicago Executive airspace I tuned in Chicago Approach, things sounded slow so I made my VFR request for flight following which was granted. As I approached the Chicago skyline I received a single traffic advisory for a plane off my 11 o'clock reporting the same altitude. After searching for a few seconds I saw the aircraft which was about a mile away and no factor. Other than that I had the Chicago Skyline airspace all to myself. After clearing the Chicago O'Hare Class B airspace I climbed to 3,500 feet to put me above the airspace for Gary International and turned further Eastbound toward Valparaiso. This was my first flight to Porter Country but as I neared the airport I realized I had flown out of here once before as a passenger on a B-17 Bomber, definitely a found aviation memory of mine. I overflew the airport and entered a left downwind for runway 27 and made a smooth landing. As I began to taxi back several other airplanes entered the pattern. I did a 360 on the taxiway to view the traffic, I noticed there was a Piper Cub flying a low and tight traffic pattern and he had not been using radios, or was not equipped with them. Both the Cub and the Cessna turned base at the same time, though the Cub's base was much tighter than the Cessna's. Iannounced to the Cessna that the Cub was there as I don't think he had seen the Cub flying a lower and tighter but nearly identical pattern. The Cessna thanked me for the alert and ended up opting for a go around while the cub flew nearly the full length of the 7,000 foot runway before setting down for landing, I guess his hangar must have been on the far end of the airport. The return flight was uneventful. Though, when I called Chicago Approach for flight following they asked me to to standby as the were busy with commercial traffic. They never did have capacity to offer me flight following services on the return leg. Though, it worked out alright as I did not encounter any traffic on the way back which surprised me on such a beautiful morning. I logged another 1.8 hours of cross country time which will come in handy when I am ready to start pursuing an instrument rating, something I am thinking about more and more seriously this Spring.